Here a question arises: should we speak of aeration or oxygenation? The two terms lead to confusion, and it is sometimes thought that aerating the water means introducing oxygen. In fact, when a volume of water is circulated, the agitation of the surface facilitates both the penetration of atmospheric oxygen into the water and the elimination of the carbon dioxide dissolved in the water. 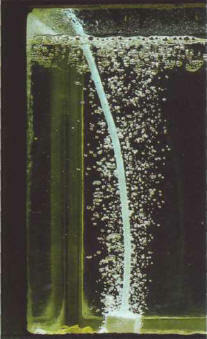 It is not therefore the bubbles produced that directly oxygenate the water, but the movement they create. Circulating also allows the heat given off by the heating apparatus to be diffused and thereby distributed evenly over the whole tank. The water expelled from the f i l t e r can also help to stir the water in the tank. 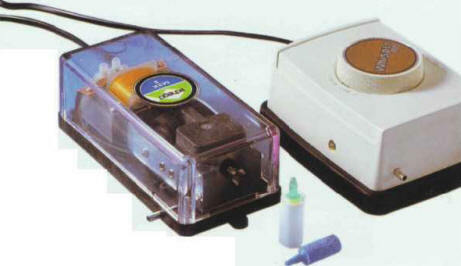 There are several types of air pumps; some have controls to regulate their intensity. Obviously, if an aquarium is well balanced, there is no need to aerate it: this is often the case in small, normally planted, and quite densely populated tanks. However, gentle aeration does provide a degree of security. For large aquariums, in contrast, aeration is recommended, especially when they house fish with high oxygen requirements, such as the large freshwater Cichlids. Strong aeration is similarly necessary in marine tanks, in the form of vigorous stirring of the water, to recreate the conditions of the natural setting. A small pump, connected to the mains, draws in the atmospheric air surrounding it and pushes it along a narrow pipe to a diffuser. This forms the bubbles that will break on the surface of the water. There are several models of pump, of varying degrees of output, according to the volume of air required; the smallest are sufficient for aquariums of a maximum volume of 100-150 liters. Pumps make a certain amount of noise, which may seem a nuisance, as an aquarium is generally appreciated for the impression of silence and serenity that it creates. The output of some pumps can be regulated, making it possible to increase or decrease the volume of air produced. There are several types of air distribution pipes, of varying degrees of rigidity, of which the most common diameters are 4-6 mm. It is best to choose one that is fairly stiff, as. if it happens to get jammed, it will not be completely flattened and will still allow a little air to pass through. Always buy a piece of tube longer than you need, to avoid any unpleasant surprises. There is a wide range of diffusers on the market: rectangular or cylindrical, in natural or artificial materials. 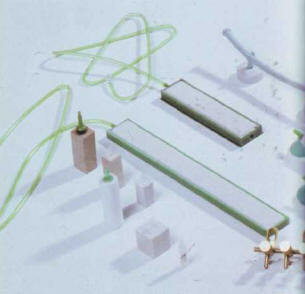 The most practical ones are made of microporous or ceramic materials. These produce very fine bubbles and can be cleaned easily when they get clogged up. Do not forget that diffusers will become encrusted with calcium, salt, or algae after they have been in use for a while. They have the disadvantage of floating, so they must be held down, with a stone, for example. Be aware that diffusers that produce fine bubbles require stronger air pressure to maintain the flow. There is such a huge range of aeration accessories that no aquarist will have any problem finding equipment suited to his or her individual requirements. if the output of the pump cannot be regulated, make a shunt with a faucet on the end, to allow a slight controlled escape of air (this solution is effective only in some pumps). Various small accessories complement the main items. 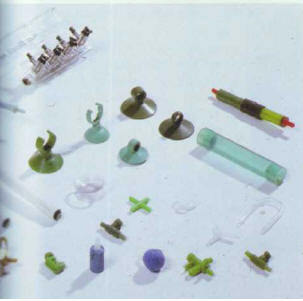 Connectors, shaped in the form of a T, Y, or X, make it possible for a single pump to supply several diffusers. in the same tank or in different ones. Faucets regulate the flow when there are several channels. There is a variety of models, in plastic or metal, single or in sets for large installations. It is best to place the pump above water level; this eliminates the possibility of water flowing back down the air pipe when the current is switched off. A pump can sometimes be found below water level, especially in built-in aquariums, and so a small valve must be inserted to reduce the above risk. It is not the bubbles from the diffusers that oxygenate the water, but the movement that they create. Perfectionists place the air pump outside the room containing their aquarium, to avoid any possible diffusion inside the aquarium of toxic products, such as aerosol sprays or cigarette smoke. Small filters are able partially to purify the air. These consist of active carbon that absorbs smells and fumes, which is placed in the air circuit after it leaves the pump. Many aquarists consider that bubbles in a tank provide a somewhat unnatural appearance, so they hide their diffusers and pipes in the decor, and the bubbles are only noticeable when they break the surface of the water. For the reasons mentioned above, the ideal position for a diffuser is close to a heating apparatus. However, make sure that no pipe comes into direct contact with an element. Since a diffuser stirs the water, sometimes vigorously, it is possible that it also puts back into suspension various pieces of debris, such as excreta, uneaten food, and pieces of vegetation. If the suction of the filtration system is nearby, this is not a serious problem; if this is not the case, there is a risk that this debris will spread over the tank, with all the unappealing visual results that may be expected. To avoid this annoyance, do not put the diffuser on the bed, but to place it halfway up the aquarium. It is advisable to check that the lid fits properly at the point where the bubbles reach the surface, in order to avoid any splashing of water onto the lighting hood. The faucets regulating the air must obviously be placed outside the aquarium. Often, in the case of well planted aquariums, no aeration equipment is used, as the plants themselves produce enough oxygen. HOW MANY DIFFUSERS IN AN AQUARIUM? This depends on the volume and type of aquarium. in sea water, use one diffuser for every 75-100 liters, at top intensity. One of the smaller pumps on the market is sufficient, along with a few meters of pipe and a diffuser in microporous plastic. 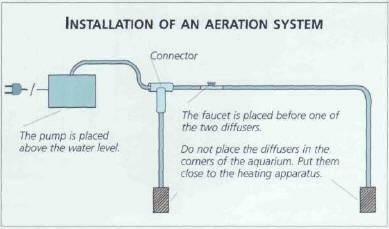 If the pump is placed below the water level of the aquarium, it is vital to acquire a valve to prevent the water flowing back. ТЕРЕХОВСКИЙ Мартын Матвеевич (1740-96) , российский врач и натуралист, первый в России протистолог. Труды по микробиологии, ботанике, эпидемиологии.